Well, I was supposed to announce the winner of the Grand 200th Post Giveaway yesterday, but I have been having some issues with my computer and printer, and I wanted to read through all of the comments to make my decisions but I read the printed page better than a screen. So the prize winners will be delayed a few days until I get all my ducks in a row with the time to read through them all. I must say that I really have enjoyed my first glance-over of the comments. Some very creative responses that will make it hard for me to choose….good job peeps!! I will also say that I was thinking something slightly different than most of you for the word bungalow. I was thinking woodsy Arts and Crafts style 1900 home, and a whole lot of you were thinking palm trees, coconuts, drinks with little umbrellas, and pool boys….okay only one comment that I remember mentioned a pool boy, and that was actually a cabana boy, but there may be more…..like I said, I haven’t read them all yet. On the word cottage, we all think pretty similarly it seems. Thanks for taking part in that little word “survey”…it will be fun to see what everyone thinks. 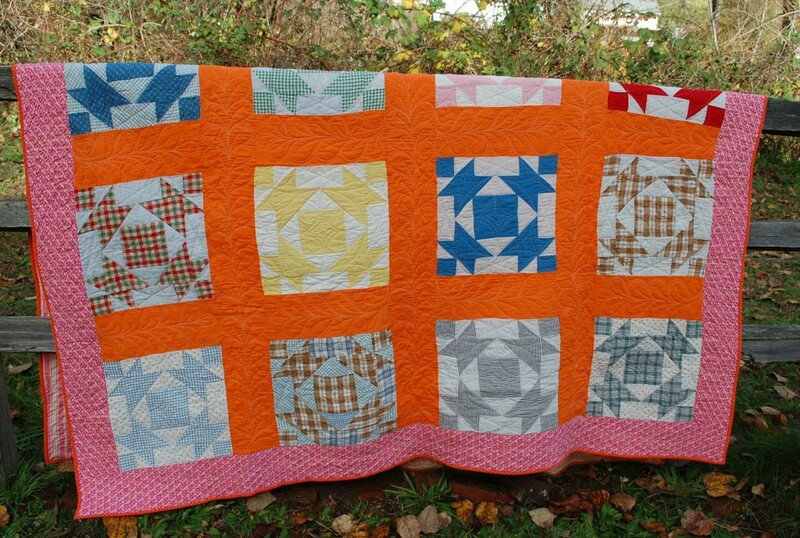 For today’s pix (since I really can’t leave you without any pictures) how about that orange quilt finished up?? This quilt will really make your winter pop!! Well that’s it for now….I am off to the studio for more sewing tonight…so glad to be back at it again!! Wow what a great quilt! Very bright and cheerful! Oh that orange is just perfect for the winter, well and the summer too I am a sucker for orange. I totally forgot to mention pool boys in my description lol….but I can picture what you mean in terms of bungalow I am partial to Frank Lloyd Wright so perhaps one of his amazing structures is more your style, I know I could live in one! Love Beckys quilting on this one. She did a great job of quilting ginko leaves on my brothers quilt. It really makes the piece. Isn’t Becky great!? I love that you went to her!! In my opinion, you really can’t have too much orange in a quilt. Love this one. I like you orange quilt, wasn’t what I was expecting but very pleasing nonetheless. cool how you took a bold, in your face color like orange, and made it feel like big hug! !